Should London delivery firms emulate their New York counterparts? In today’s modern age where the world never sleeps and everything is instantaneous, the concept of next-day delivery, while still extremely important and desirable, is nothing new. People don’t want to wait long for the items they purchase online and dread the day when a ‘Sorry you were out’ card is found on the doorstep rather than a neat little package. Some delivery companies, notably Amazon and DHL, have already been experimenting with new methods of parcel delivery, which includes delivery drones and giving drivers temporary access to car boots in order to safely deposit packages. But whilst those methods undergo rigorous testing, it seems that Amazon have taken the lead again. Rather than investing in swanky new technology, the delivery giant has decided to make use of the transportation already available to them and are now offering one-hour delivery in New York City. How are they doing this, we hear you ask? By putting their couriers on the infamous subway system that criss-crosses the city far below the tarmac. With it emerging that Amazon employees have been hopping on and off subway trains with parcels, we take a look at the new delivery system, and whether it could be a viable option in the UK. So, how does it work? Currently Amazon are only offering the ‘one-hour’ delivery option on smaller everyday products such as soap and mobile phone chargers, and the service is only available in certain zip codes. 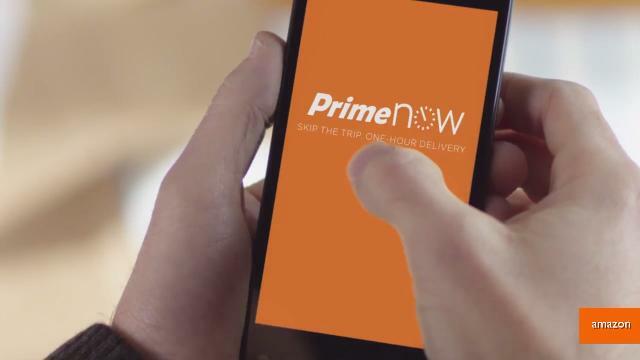 Although you can check your area online, if you want to use Amazon Prime Now you will have to download the app and pay a fee of $7.99 (£5.12) for delivery within an hour – and that’s on top of your existing Amazon Prime subscription, currently priced at £79 in the UK. But if you’re happy to receive your delivery within 2 hours, then it’s free of charge. Regardless of where you stand on the pricing, it’s good to see consumers being presented with more options. You don’t have to look very hard to find the reason behind Amazon’s use of the subway. With New York City’s infamously gridlocked roads, heading underground was really one of the only viable options left if Amazon customers were to receive their parcels on time. But with London’s roads sometimes being just as bad as the Big Apple, many people are wondering whether Amazon will roll out their Prime Now service to the English capital anytime soon? According to The Independent, Senior Vice President of Amazon’s Worldwide Operations, Dave Clark, has said that Amazon Prime Now will be coming “to additional cities in 2015”. However, there has been no official confirmation or news whatsoever surrounding a UK rollout, and the London Evening Standard reported that Amazon had refused to comment on whether they were seeking to use the London Underground. However, the possibility of Amazon using the London Underground to deliver packages to eagerly-waiting City workers would not be met without opposition, as the London Evening Standard reported that the RMT Union (National Union of Rail, Maritime and Transport Workers) has warned that plans to use the London Underground in order to deliver parcels would be a “cheapskate way to cut corners” and could “cause absolute chaos”. It seems that every time a new method of delivery appears, another one is right behind it ready to be faster and easier. Years ago, many people probably thought that the logistics of next-day delivery were impossible, and now it is expected as an option, if not standard. As it stands, it doesn’t look like the UK will be getting Amazon Prime Now any time soon, but it’s clear that the nation’s online retailers are always exploring different options to make parcel delivery even more convenient for consumers. Robert Mead, Marketing Manager at Parcel2Go.com, believes that same-day delivery is the next step forward: “Now that next-day delivery has been established, people will be looking forward to the next step; receiving their products the same day they order them.